Man of the month James Kaloczi. Picture: Terry Rickeard. 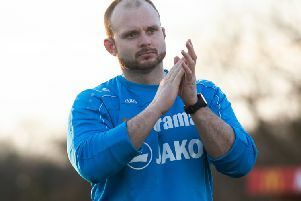 Hemel’s long unbeaten run ended on the Kent coast on Saturday as they lost 2-1 at Margate in the National League South. The first half, played in overcast rainy conditions was not a pretty affair. The first chance in the half went to the Tudors with a far post header by the impressive midfielder, James Kaloczi, in the fourth minute. Kaloczi won the man of the month award for the Southern League for September. The home side didn’t muster any opportunity until the tenth minute through winger, Alex Osborn, who miscued his shot well wide of the target from the left side of the penalty area. In the 22nd minute a skiddy shot from Matt Saunders troubled the home keeper in the greasy conditions. A minute later striker James Potton saw a header deflected wide before fellow striker Jake Robinson forced home keeper Ward into a good save, as the resultant corner was recycled. Two minutes further on home striker Daniel Akindayini’s close range effort was deflected wide after an Osborn knock down. Just before the half hour mark there was a big chance for Robinson as he sprinter in behind the Margate defence only to sky his shot over the bar. Robinson then headed wide of the target from 10 yards. There was a good chance for the Blues some seven minutes later, when home skipper, Luke Moore, looped a header over the bar after a smart move. Margate duo Matt Johnson and Luke Moore worked hard in midfield to break up play that the Tudors were now dominating. A heavy two footed lunge close to the half-time interval on Dave King by Margate’s Moore, may see the Tudor man side-lined for a few weeks as he may have suffered a broken right wrist. Moore for his troubles received a yellow card. Then literally just before the half time break there was an altercation between Margate’s centre-half Manny Parry and Tudors’ Jordan Parkes where Parry grabbed Jordan around his throat, which resulted in both players being booked by the referee. It was later alleged that Jordan kicked Parry in an ‘off the ball incident’ that led Jordan being grabbed. By and large Hemel had the better possession of the half, but with no goals to show their superiority. The second half opened with a bang as in the third minute Potton, coming in on the left hand side, curled a beautiful shot pass the home keeper and into the far right hand corner of the net which underlined Hemel’s superior performance over the home side. The home side almost drew level within five minutes when striker Elliott Buchanan flashed a shot past Tudors keeper Butler, only to see the ball thump against the far post and rebound back into play. Akindayini and Buchanan then combined well to set up a chance for the latter, but Hemel defender Tony Diagne, got across well to deflect the ball behind for a corner. Just moments later the Margate appealed for a penalty when Buchannan slipped inside the penalty area, when nearly being challenged by Diagne. It was Diagne who came off the worse, as the referee waved play on, much to the consternation of the home support. Taaffe then missed a glorious chance to put the match beyond recall, when he fired over from 12 yards. However, in the 69th minute the home side drew level when striker Elliott Buchanan was put through, by the combination of keeper Ward and winger Osborn, to go around keeper, Jamie Butler, before sliding in the equaliser. A typical smash and grab move from the keeper to his centre-forward. Graeme Montgomery replaced Parkes after Margate equalised. So, as the Tudors went in search of a second goal their defence was left exposed to Margate’s other central striker, Akindayini. Who duly grabbed a second and decisive goal for the home side, some ten minutes later. He cut in from the right and bent the ball into the far corner, past the outstretches hands of keeper Butler. Adam Cash, was next into the referee’s notebook for a lunge on Jack Kelly who sportingly got up to give his cramp stricken opponent a helping hand to get rid of some of the pain. This act of kindness by Jack was interpreted by the home crowd with jeers against the referee for cautioning their player, which was totally justified. In the 76th minute Sam Corcoran made an entrance, replacing the tiring Jack Kelly, the result of which saw the Tudors revert to a flat back three with Hayden on the right, Diagne in the centre and skipper, Kyle Connolly, switching from right to left back. The referee allowed six added on minutes of play but the Tudors were unable to get that all-important equalising goal. Much to the ire again of the partisan home crowd, who wanted the match to be brought to a close before the full 90 minutes was played. They next play at Taunton Town next Saturday, October 15 in the Fourth Qualifying Round of the FA Cup.